We are observing aurora australis (southern lights) at the South Pole Station. The ASI is orientated so that the image appears as it would if the viewer was looking directly overhead (at the zenith) at the geographic South Pole. The Greenwich Meridian line passes vertically down the centre of the image at 74.3 degree counter clockwise to the top. The silhouette of the GPS antenna is just visible in the bottom-left edge of the image. Older data for 1997-2002 is also available. Please contact Yusuke Ebihara (ebihara _at_ rish.kyoto-u.ac.jp) for a consult using data from all-sky imagers before presenting any of these data publically. 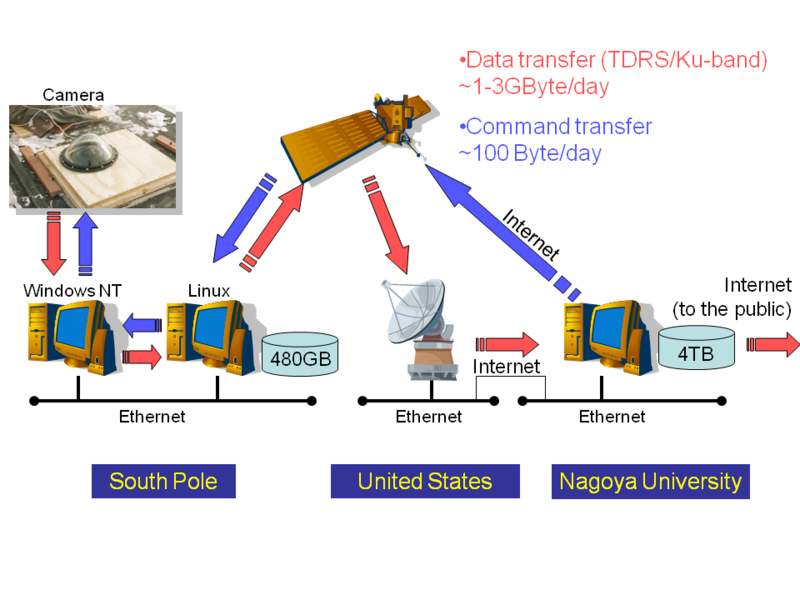 Since 2007, this project is collaboration between Kyoto University, the National Institute of Polar Research (Japan), Merrimack College (USA), and the New Jersey Institute of Technology (USA) with support provided from the U.S. National Science Foundation. The current award is ANT-1643700, with the Principal Investigator being Prof. Andrew Gerrard (New Jersey Institute of Technology, New Jersey). For further information, please see www.space-antarctica.org.